Scott Pruitt, Oklahoma Attorney General, Is Reportedly Trump's Pick To Lead EPA : The Two-Way Pruitt has made no secret of his disdain for the Environmental Protection Agency — his official biography calls him "a leading advocate against the EPA's activist agenda." Oklahoma Attorney General Scott Pruitt arrives for meetings with President-elect Donald Trump at Trump Tower in New York City. 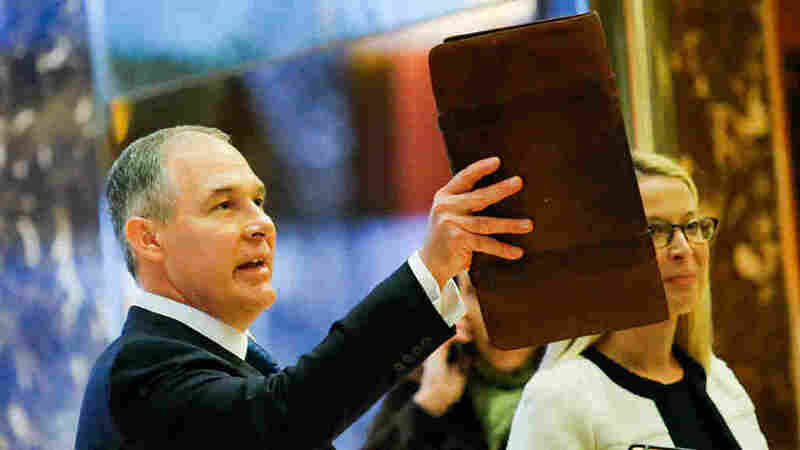 President-elect Donald Trump intends to nominate Oklahoma Attorney General Scott Pruitt to head the Environmental Protection Agency, announcing his decision in a statement Thursday. As attorney general, Pruitt has made no secret of his disdain for the EPA. Pruitt, who met with Trump Thursday morning at Trump Tower in New York, has been an ardent defender of fossil fuels and the coal industry. The New York Times has reported that one letter to the EPA from Pruitt was ghostwritten by lawyers for Devon Energy, an Oklahoma oil and gas company. He spent eight years in Oklahoma's Senate before being elected state attorney general in 2010. In that role, he set up a "Federalism Unit" aimed at ferreting out and combating what he viewed as federal overreach. Conservative columnist George F. Will has called him "one of the Obama administration's most tenacious tormentors," explaining how Pruitt had been fighting against the Affordable Care Act as well as the administration's changes to immigration policy. "The American people are tired of seeing billions of dollars drained from our economy due to unnecessary EPA regulations, and I intend to run this agency in a way that fosters both responsible protection of the environment and freedom for American businesses," Pruitt said in a statement Friday. In that statement, Trump said the EPA has pursued "an out-of-control anti-energy agenda that has destroyed millions of jobs," and that Pruitt "will reverse this trend and restore the EPA's essential mission of keeping our air and our water clean and safe." Pruitt grew up in Lexington, Ky., and won a baseball scholarship to the University of Kentucky. He earned his bachelor's degree in communications and political science at Georgetown College and then a law degree from the University of Tulsa College of Law. He worked in private practice as a lawyer and co-owned a Minor League Baseball team called the Oklahoma City RedHawks. In an interview with the Oklahoma Independent Petroleum Association, Pruitt described himself as "a big fan of beef" and said his favorite drink was coffee. The Sierra Club released a statement that called Pruitt "unfit" to lead the EPA. "Having Scott Pruitt in charge of the U.S. Environmental Protection Agency is like putting an arsonist in charge of fighting fires," it read in part. "He is a climate science denier who, as Attorney General for the state of Oklahoma, regularly conspired with the fossil fuel industry to attack EPA regulations."